The recipe for this week’s Muffin Mondays was Rum Raisin Muffins. Upon seeing this I instantly thought rum – mmm piña coladas! The original recipe calls for rum soaked raisins, but seeing as I despise raisins I decided to substitute rum soaked pineapples in their place. Throw in a little toasted coconut and a little extra rum and these muffins are perfectly indulgent and perfectly reminiscent of a cold and refreshing piña colada. 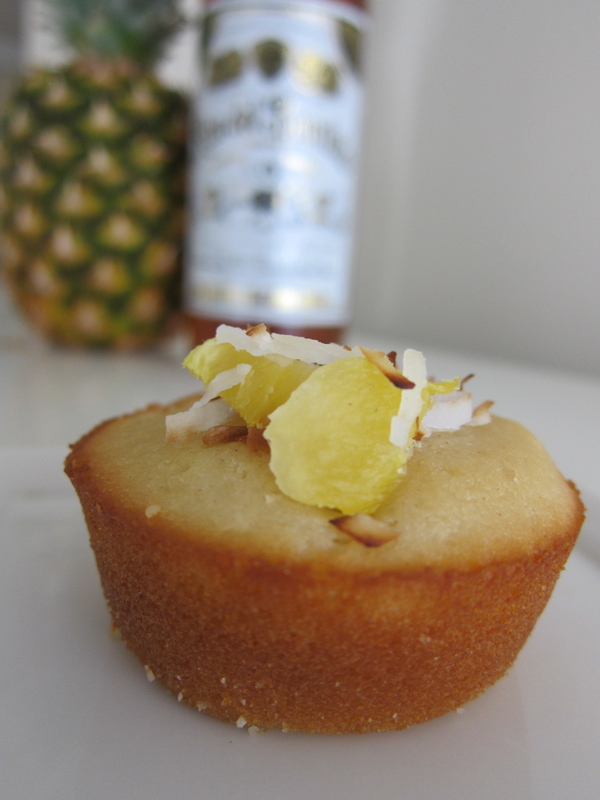 The amber rum with undertones of caramel and the creamy amalgamation of coconut and sweet pineapples blend into a muffin creation that is sheer magic. It is an unmistakable and completely satisfying flavor that evokes summer. Summer may be quickly coming to an end but these muffins will whisk you away to a vacation paradise. Just close your eyes and picture sand between your toes, the sun shining brightly above and the sound of crashing waves. Eat and enjoy! * Note for whatever reason these muffins were incredible hot out of the oven, they even had an amazing almost custard like flavor, but they do not preserver well and when eaten the next day they are dense and chewy so try to enjoy same day! An hour before leave the pineapples in the rum to soak. In a medium bowl sift flour, salt, baking powder, sugar and coconut. In another bowl mix the egg, milk, melted butter, vanilla extract and coconut extract. Add the wet ingredients to the dry ones and fold together lightly with a fork. Fold in pineapples and any remaining rum. Do not over mix, it is supposed to be a very wet batter. Fill muffin cups 2/3 full. Bake for 20-25 minutes or until a toothpick comes out clean. How funny! I thought of pina colada muffins too but I skipped this one though. I will be back soon, even though I’d like pina colada better than rum raisin, it’s still not my thing & sadly not hubs’ either so the muffins woulda sat there uneaten, how sad! However I’m glad yours turned out very well. Maybe I’ll make em when I have a crowd to feed! A – boozy anything makes the world go round! Aimee- I just can’t let go of summer want it to be summer always! Elena- yeah it is funny how so many people strayed from the recipe this time! I’ll take a dozen please! I adore the muffin Monday posts. Raisins are ok but would choose pineapple over them any day. Now this is my kinda muffin. Could not look more delicious!